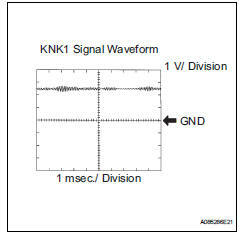 Flat type knock sensors (non-resonant type) have structures that can detect vibrations over a wide band of frequencies: between approximately 6 khz and 15 khz. A knock sensor is fitted onto the engine block to detect engine knocking. 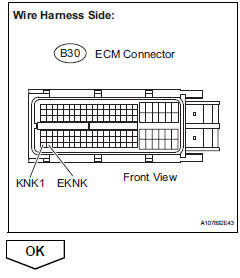 When any of dtcs p0327 and p0328 are set, the ecm enters fail-safe mode. During fail-safe mode, the ignition timing is delayed to its maximum retardation. Fail-safe mode continues until the ignition switch is turned off. If the output voltage transmitted by the knock sensor remains low or high for more than 1 second, the ecm interprets this as a malfunction in the sensor circuit, and sets a dtc. If the malfunction is not repaired successfully, either dtc p0327 or p0328 is set 5 seconds after the engine is next started. Select the following menu items: diagnosis / enhanced obd ii / data list / user data / knock fb val. Read the values displayed on the tester while driving the vehicle. The knock feedback value change can be confirmed by running the engine at high load, for example, by activating the air conditioning system and revving up the engine. Disconnect the b18 knock sensor connector. 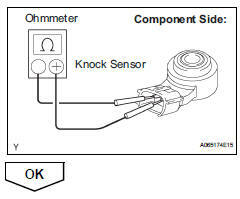 Measure the voltage between the knock sensor terminals. Reconnect the knock sensor connector. Fault may be intermittent. Check the wire harness and connectors carefully and retest.